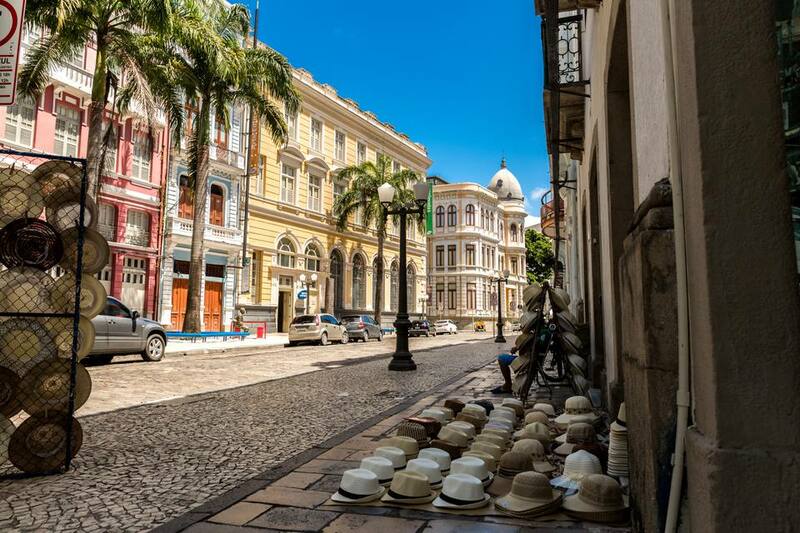 Recife is beautiful anytime thanks to its average year-round temperature in the 80s F. However, the city puts on a great carnival so you might want to schedule a visit to the Recife and Olinda carnivals in February/March, or to the off-season carnival, called Recifolia, in October. Either occasion means thousands of visitors, so make your reservations early. Brazil is known for its beaches and Recife is no different. One of the best places to catch some sun is Boa Viagem, an upscale area, which also offers most of the restaurants and nightclubs — some of which are oceanfront. Just keep in mind that this beach is known to have bull sharks, so you may want to stay on the sand instead of going for a swim. Take a walking tour of the old city from the Praca da Republica to the impressive, 19th-century Teatro Santa Isabel and then the Catedral de Sao Pedro dos Clerigos. Next, browse through the colorful Mercado do Sao Jose (Saint John's Market) for local arts and crafts and handiwork, including a special section for lace, and finish your walk at the Basilica de NS da Penha. The Shopping Center Recife is Brazil's second largest shopping center. It's been open for more than 30 years and now features around over 450 stores, 90 food options, and 14 cinemas. The mall is just five minutes from the Recife International Airport and a few blocks from the Boa Viagem beach, so it's a prime spot for tourists and locals alike. Museu do Homem do Nordeste is considered one of Recife's best museum. It displays art and objects that shows the anthropology, history, and culture of the people in this region. The museum's modern galleries were built in 1979 to showcase local artifacts and works. In Olinda, the Folclore Nordestino festival at the end of August is a highlight of dance and music from the entire northeastern region. Boa viagem!